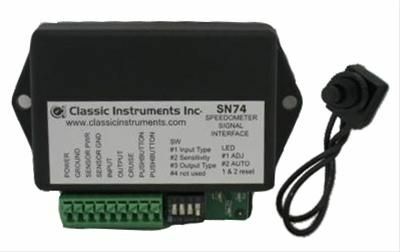 Quickly and accurately program your speedometer with Classic Instruments speedometer signal interface modules! Push the button once, drive a measured mile, and then push the button again! That's all there is to it! These modules install inline between the transmission pulse signal or ECM speed output and your electronic speedometer. They convert all known pulse signals to 16,000 ppm or 8,000 ppm signals and include an additional 8,000 ppm output signal for your cruise control. 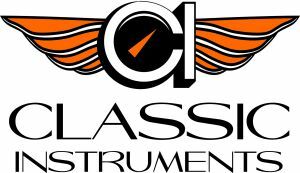 Classic instruments speedometer signal interface modules have a real-time calibration feature, allowing for total fine-tuning. Their filtered power source eliminates interference. These compact modules are designed to work with most aftermarket electronic speedometers and they can be mounted anywhere inside your vehicle! Kundenbewertungen für "Classic Instruments Wandler für Tacho Signal"